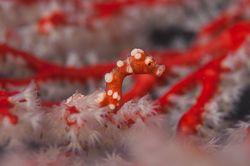 For many people, one of the main attractions of the Bird’s Head Seascape is the pygmy seahorse (well I like to think so at least). Certainly, Raja has amongst the highest density and diversity of these diminutive fishes on the planet. If you haven’t seen one yet, they almost defy belief. It is easy to list any number of unusual features about them: a horse-like head ending in a puckered mouth, a monkey-like prehensile tail and eyes that move about independently. From the tip of its pug-like snout to the tip of its stretched out tail, the largest can only just reach across a US quarter. Even stranger than all of this is their reproduction where extraordinarily devoted fathers become pregnant and strict monogamy is exhibited between life-long partners. I was recently on a trip exploring Raja Ampat aboard the Arenui, joining a cruise as resident pygmy seahorse expert. Several years ago, I completed the first research on the biology of pygmy seahorses for my PhD thesis and was excited to spend a trip dedicated to these miniature fishes. Five of the six described species of pygmies have been named since the turn of this millennium, which explains why there has been so little research on them. During the trip aboard Arenui, I gave a series of lectures about my findings and the area’s astounding marine life in general. We were lucky to see three of the area’s four species during the trip and there was great engagement from the guests who enjoyed hearing of the soap opera-like social lives of pygmies. Bargibant’s (Hippocampus bargibanti)| Bargibant’s pygmy was the first species to be discovered. A researcher at the Noumea Museum in New Caledonia accidentally found the first pair when he collected a gorgonian coral for the museum’s collection. The species was named after him in 1970, but divers weren’t regularly seeing them until the 90’s. Bargibant’s pygmies only live in association with Muricella gorgonians and are covered in tiny bumps that mimic the coral’s closed polyps. Denise’s (H. denise)| This is another gorgonian-living, and commonly seen species in Raja Ampat. They can be distinguished from the closely related Bargibant’s species, by their more slender shape and longer snout. They are also much more cosmopolitan than Bargibant’s: so far I have found them living on ten different types of gorgonians. As a result of them inhabiting such a variety of habitats, their colours and surface textures are much more variable than Bargibant’s. I have seen various hues of yellow, red, pink and even white. Raja Ampat is also known for an, otherwise rare, red and white variety that inhabits Melithaea gorgonians. Pontoh’s (H. pontohi)| In 2008, the two species of free-living white and brown pygmies were given the names, Hippocampus pontohi and H. severnsi respectively. However, it appears that scientists may have jumped the gun. Genetic evidence has since shown that they actually represent two colour forms of a single species. The name ‘Severn’s’ is being dropped and Pontoh’s will be retained into the future. Like many seahorses, this new evidence shows just how much variability there can be within a single species of seahorse. Camouflage is so important to pygmies that they generally match their surroundings very closely. White ones are most often seen around Halimeda algae, and brown ones around hydroids. Satomi’s (H. satomiae)| This is the least common of the Bird’s Head’s pygmies, and in fact is currently only known from Indonesia. It is also the smallest pygmy, not even reaching across a dime. Very little is know about this species, but it seems to become active around dusk and is generally found slightly deeper than the other free-living species. When I have seen them, they’ve often been attached to soft corals and hydroids beneath a large over hang. There are beige and dark brown colour forms, and all are very active swimmers. Sometimes it can a bit of a double-edged sword leading a trip that encourages people to interact with and photograph pygmies. I am always very keen to encourage non-invasive interactions where we can enjoy and capture images of them, without causing stress or harm. The take-home messages I hope to promote are there should be absolutely no touching of the pygmy or their gorgonian, and to limit the number of strobe-lit images. In fact, this subject was part of my PhD research and the findings are available as a code of conduct document that helps us to avoid certain behaviours that cause direct stress to the fish. 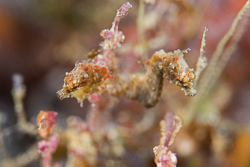 Relatively recently Project Seahorse, the world’s largest seahorse conservation organisation, began a citizen science initiative called iSeahorse. This is designed primarily for who are able to record their seahorse sightings. 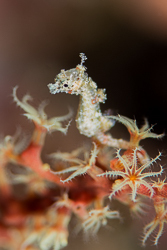 This includes pygmy seahorses, and the big ones too. Next time you are diving and spot a seahorse, please record and log your observation. You can check out the website to learn about the kind of information that is valuable to them. I used iSeahorse to register my find of a Bargibant’s pygmy near Tokyo, which extended their known geographic range by hundreds of miles northwards. 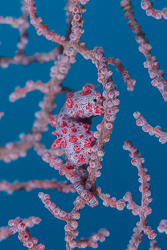 Raja Ampat is one of the few pleases where you can see four of the six species of pygmy seahorse. It’s hardly surprising, given the extraordinarily high biodiversity of the area and it’s fantastic level of protection. 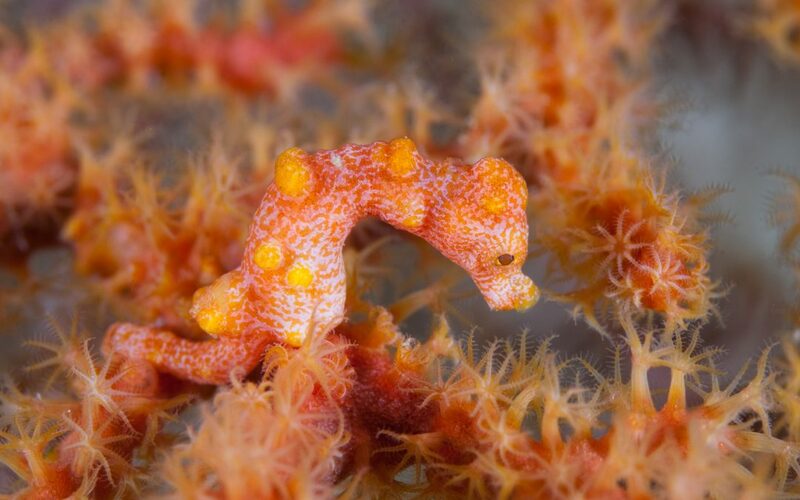 Just remember, whilst enjoying pygmy seahorses please ensure not to disturb them. Parasites permeate every corner of the animal kingdom; indeed, even parasites have their own parasites. With one of my PhD colleague’s research focusing on coral reef fish parasites I started to pay more attention to these sinister members of the community. Now I can hardly do a dive without coming across a stricken fish or other reef creature that is suffering at the hands of one of these insidious but fascinating beasts. In January this year I was aboard Dewi Nusantara for my charter exploring Raja Ampat’s southern reaches and the island of Kofiau. As always, I gave lectures about the area’s marine life, so my regular guests are well aware of my penchant for external parasites. Several even come up from their dives regaling me with stories of how many they’ve seen: there is a funny ecological quirk whereby if one fish is infected often a large proportion of the same species locally also will be. According to my colleague, this is because these parasites ‘burst’ spawn and their offspring will infect many other individuals around the same area. Parasites are extremely common on coral reefs. Some bite and gorge themselves on blood very rapidly then drop off, whilst others grip on their host for their whole adult life. The external parasites that have been the focus of my natural history notes of late are isopod crustaceans, which are basically marine pill bugs (woodlice for the Brits, or sea lice to anglers), found in the family Cymothoidae. They are extremely species and site specific, usually found in the exact same location on just one host species. Some attach themselves externally to scales, others are flesh burrowing (I saw some of these in temperate Australia recently, and they made me feel quite queasy), some attach to the gills and others live in the fish’s mouth. Most recently, amongst one of the enormous schools of passing fusiliers at the dive site ‘Boo Windows’, something caught my eye under one of the fish’s chins. When I was able to get a closer look at a cleaning station I saw that the stricken fish had a huge white isopod parasite clutching to the underside of its head. It had obviously been there sometime, as the fish was slightly deformed where the parasite’s little legs were latched on. There was even a groove for the parasite to rest. Whilst many of these copepod parasites are dark in colour, I was interested to see that this one was white. Fusiliers’ type of colouration is known as countershading, whereby their belly is paler than their dorsal surface. This helps to camouflage them against predators from above, as their dark top-half acts as camouflage against the darker water below. Contrastingly, the pale belly camouflages them against predation from below against the predators looking up at the bright sky. The parasite appears to have followed suit and matches the fish’s paler ventral colours. Through natural selection, one would assume that fish carrying dark parasites would more likely be eaten than those carrying pale chin parasites. The pale parasite is less likely to draw the attention of their host’s predators. Since this would also mean that the parasites too are less likely to be eaten and are thus able to pass on their genes, eventually a pale parasite has prevailed. I was intrigued to see only one isopod living under the fusilier’s chin, but in one of my images I discovered that there was actually another smaller individual living under the larger one. The bigger of the two is the female, and the tiny one beneath is the male. Since he is hidden under the large female’s tail, he is dark grey in colour. After mating, the eggs of cymothoid isopods develop in a pouch on the female’s body. There the young hatch and undergo their first moult. The active and agile young then leave the brood pouch and go in search of a host of their own. They have well-developed eyes, helping them to track down a host. Between leaving the mother’s pouch and making permanent attachment on their new host, they undergo several moults. Each stage is perfectly adapted for the job the larva needs to complete. Sensory structures come and go and at the last stage grasping claws appear, which help their final attachment to the host. These isopod parasites are common on the reef and infect many different fishes; however, they are not only limited to fishes. There are certain species that also inhabit the gill arches of crustaceans. Whilst they look punishing for the host, parasites generally don’t kill them. They can cause lesions, reduced their growth rates and make them weak and more prone to illness or predation, but the parasite wouldn’t actually benefit from the host’s demise – they’d lose their home. Some parasites have extremely sinister tricks up their sleeve to ensure that they alone are looked after. Certain parasites are able to sterilise their host, so the host producing its own offspring does not waste vital energy. Next time you are diving in Raja Ampat, I suggest you keep you eyes peeled for these sinister hitchhikers living on the reef’s creatures. 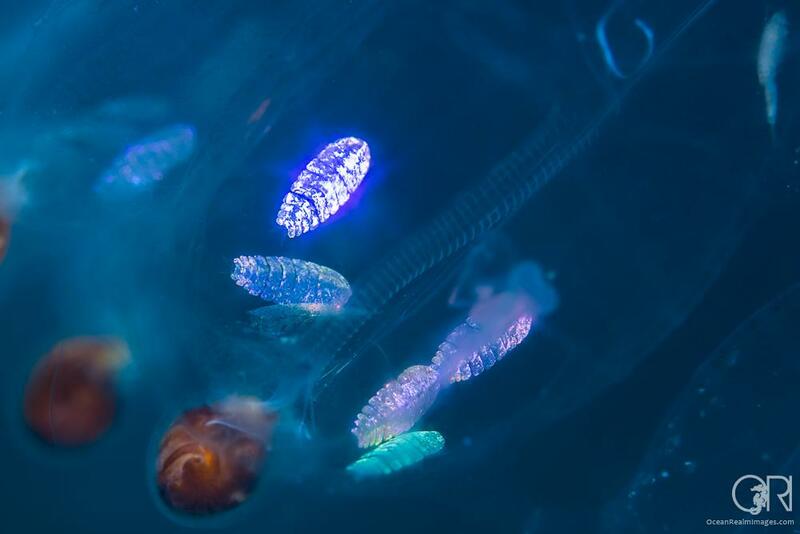 Unsurprisingly, there are more species of these parasites in the Coral Triangle region than anywhere else on Earth. After all, they too help add to the extraordinary number of species that make coral reefs one of the most biodiverse ecosystems on the planet. Raja Ampat is famed for its outstanding fish diversity, so it’s sometimes forgotten that the area’s species richness extends beyond the piscine delights. Although I would probably count fishes as my first love, I have a lot of time for crustaceans, and there’s usually a shrimp or crab of some kind that I’m hunting for during a trip. At the heart of the Coral Triangle, I knew that the Bird’s Head’s high biodiversity would make it a great place to seek my latest target, the giant clam shrimp. So, on my recent trip aboard Dewi Nusantara, I spent many hours scouring these massive molluscs for their miniscule residents, leading me to ponder the region’s other crustaceans too. Coral reefs are well known for the huge numbers of species they accommodate. One of the reasons the biodiversity of a reef is so high are the close interrelationships between different species. Most are very closely associated with just one species. Spotted and spiny porcelain crabs for example live only with certain anemones, Coleman’s shrimps live only with fire urchins, whip coral shrimps obviously live on sea whips and new examples are discovered all the time. A few years ago, Ned and Anna DeLoach continued their legacy of discovery by finding a type of porcelain crab that lives only on the anemones that live on the shells of certain hermit crabs! This level of union blows my mind, but is commonplace in Raja Ampat and the Coral Triangle. Apart from some non-group expeditions, in the six months since my last blog I’ve run trips to Atlantis Dumaguete Resort and aboard Atlantis’ Azores liveaboard around Cebu Island in the Philippines. Most of the guests joined us for the entire 18 days and we saw such amazing creatures as 18 seahorses on one dive, 11 frogfishes on another, thresher sharks, whale sharks, Lembeh seadragons (Kyonemichthys rumengani) plus many more. As always, we donated some of the proceeds from the trip to a conservation organisation. 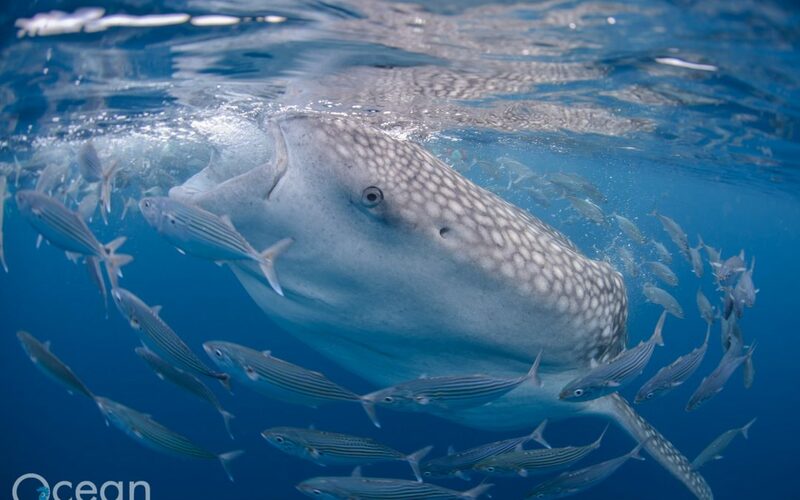 In this case we chose the Marine Megafauna Foundation, who strive to protect the world’s biggest marine fishes. Just recently also I completed a trip aboard the Bilikiki in the Solomon Islands. I am always blown away by the remoteness of the Solomons. The reefs are pristine and full of life, whilst on land, we went to a village that had never been visited by foreigners in the 60 years since it was founded. I can’t imagine that’s true of many places in the world these days. My underwater highlight was certainly Lynne’s pipefish (Festucalex rufus), which I have been looking for for sometime but had never seen before. NEW | 22 – 31st August 2017 (9 nights) | Muck Magic Trip 1 – Sangeang Island & Bima Bay aboard Damai II (Labuan Bajo to Bima). This ‘Our Beloved Seas’ trip is a joint trip between Wendy Brown and myself. We have recently added this and the trip directly following it, but the second trip filled in minutes! If you’d like to join us in these exceedingly rich and rarely visited areas for critter hunting please contact Wendy or myself(Richard@OceanRealmImages.com) for more information. We expect space to fill fast. Wendy and I have repeatedly been asked by our guests to plan some trips to destinations outside the Coral Triangle. However, knowing how our regular guests love that area’s warm waters we have planned back to back trips to the Galapagos Islands in February/March when the waters of these mystical and historic islands tends to be warmer and clearer – whilst maintaining their renowned bounty. As always, I’ll be giving talks and this will be the perfect place to share my passion for evolutionary biology, which was the subject of my Master’s degree. NEW | 23rd July – 1st August 2018 (9 nights) | North Cenderawasih Bay & Mapia Island aboard Dewi Nusantara(Manokwari to Manokwari). This first trip aboard Dewi Nusantara will take us to new ground. Whilst we will start and end the trip in Cenderawasih Bay, we will take this opportunity to visit Mapia and its surrounding islands 100NM north of the bay, and the equator. Here the remote and very rarely visited reefs are bustling with life and ripe to be explored. NEW | 3 – 13th August 2018 (10 nights) | Classic Cenderawasih Bay aboard Dewi Nusantara (Manokwari to Sorong). Starting in Manokwari, we will sail to the southern reaches of the bay in search of the area’s world renowned whale sharks. We plan to spend a couple of mornings face to face with the sharks before continuing our search for other amazing fishes found only in the bay. It is well know for the high numbers of endemics, which you’ll learn all about in my talks! ‘Bird’s Head Natural History Notes part 1: In Appreciation of Damsels’ – Bird’s Head Seascape website. A new series about my adventures in the BHS. I’ve also had a couple of cover shots for Asian Diver and Sport Diving magazines as well as having my shot ‘Whip Gobies and Eggs’ judged as a finalist in the ANZANG Nature Photographer of the Year. Thinking ahead, I will also be speaking at the ADEX dive show in Singapore from 15-17 April 2016, so come along if you can! – I am always on the hunt for new and exciting beasties under the sea, so I thought as a final whimsy I would share my top five new finds of 2015. After 3,000 plus dives there’s still so much to see. This is why I keep diving and we always donate what we can to help preserve the amazing oceans.